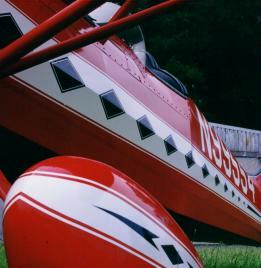 The Bakeng Deuce Airplane Factory will soon offer complete CAD-developed plans for the Deuce. CAD drawings of the original plans have been completed. Work is in progress now to incorporate modifications into the new drawings. The Deuce is easy to build and the plans are straight-forward and easy to follow for the first time builder. Note: Cowling halves will accommodate up through the 0-320 engine sizes with ample room. They are molded in top and bottom halves, splitting at the centerline of the cylinders for ease of engine maintenance. The original Deuce had an 0-290 engine developing 125 HP. The Deuce has been built with engines ranging from 100 to 160 HP. The Deuce has two filet tanks. One is located in the four foot top section over the fuselage and the other is behind the firewall in front of the front cockpit. These tanks are fabricated from heliarc welded aluminum and in the future will be available pre-welded. They have a combined fuel capacity in excess of 30 gallons. The wings are 2 spar design with built up ribs. The front spar is solid spruce 5 11/32" deep and 3/4" thick. The rear spar is 3 7/16" deep and also 3/4" thick. The ailerons and flaps are of one design, also have front and rear spars and the ribs for both wings and moving surfaces are built up. In the future we will supply pre built ribs. You can assemble the ribs and nosepieces to the spar on a good flat surface. Each individual wing panel is approximately 13' 2" long x 42 1/2" wide without flaps or ailerons; this width changes to 54 inches with moving surfaces installed. The wings come off easily for transporting or storage. The four foot wide center section stays with the fuselage and is not removed for normal disassembly. Wing removal is easy. Remove the wing struts and lower the wings to the ground. Remove the attach bolts at the center section and lift the wings free. Cables to the flaps and ailerons are disconnected through access panels on the underside of the center section. Pitot lines disconnect there also. 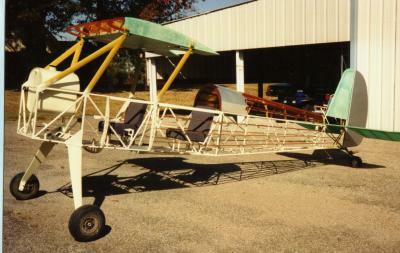 Upon re-assemble, re-rigging is not necessary since none of the rigging adjustments were disturbed during wing removal. The plans specify Cessna 140 or 170 legs. Tires are 600 x 6 and brakes are hydraulic. Wheel pants are available. The plans specify a Scott tail wheel. Although any similar installation will work, the Scott units are readily available. We have a 3400 series on our demonstrator and are quite pleased with it. Tail wheels, as you might suspect, take quite a beating which makes readily available replacement parts a major consideration. The steel tube fuselage is robust. It's comparable in construction to that of a Stearman. The pleasing contoured profile is accomplished with wood stringers attached to the steel tubing with small welded tabs. All construction is designed for durability. The fuselage without rudder or engine mount is 15 feet 9 1/2 inches long by 26 inches wide. The fuselage is covered with aluminum skins from the firewall back to the rear pilot seat; beyond that point and back to the tail, Dacron, using the Air-Tech covering process is the preferred covering method. The cockpits have doors and steps for easy entry and exit. The seating is builder's choice. We have molds and can supply seat cavities that fit into the fuselage space and are sort of a molded, bench seat or you can create a bench seat arrangement and fabricate your own "plain bench seats with cushioning" or we can supply bucket seats. The plain bench seats will afford the most "move about" room.